You are almost ready to take the ultimate flight. Enjoy the most scenic view of Ocean City, New Jersey from an exhilarating parasail chute. Visit our Home Page to familiarize you about our company. Take a ride on Ocean City, New Jersey’s most experienced and longest running parasailing charter. Ocean City Parasail has two USCG certified captains and two USCG certified boats that have helped us to maintain a 100% safety record. Discover more about Ocean City Parasail here. Mike and Joel are Ocean City Parasail’s main captains but on occasion you might find Captain Rich, Captain Mikey, or Captain Hunter at the wheel. All our Captains have a USCG License and have years of experience in our industry. Our season is Memorial Day thru Labor Day. Memorial Day weekend thru Mid-June Ocean City Parasail operates on the weekends only – Friday, Saturdays & Sunday. If you need a weekday reservation you can check our online availability or call us a few days in advance to make a reservation. Before booking a parasailing trip, take a look at the policies and pricing page. We offer affordable parasailing in Ocean City, NJ for your best summer vacation memories yet. Although you may find many things to do while visiting Ocean City, New Jersey, and other nearby shore towns; very few of those things can compare to the exhilaration of parasailing. This kind of thrill is indescribable. Trying to find a great place to eat in Ocean City, New Jersey? Or shopping at the Boardwalk? Get interesting “insider’s tidbits” to all of the area info here. The Ocean City Parasail blog is a place to find cool photos, happy people parasailing, and other upcoming news or highlights from our top parasailing company in New Jersey. Whether you just have a question or want to book a reservation, Ocean City Parasail welcomes you to contact us during normal business hours. Our boats depart at 8:00 a.m. and typically run until sunset. We accept Visa/MasterCard and other methods of payment. 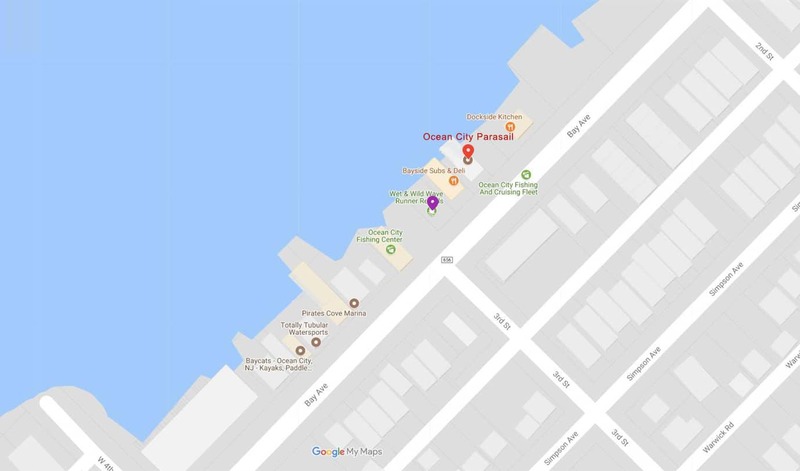 Link your Google Maps to 232 Bay Ave, Ocean City, NJ 08226 to find us easily on the eastern coast of New Jersey. Read the common directions here. You may have questions about parasailing, especially if this is your first time. Read answers to Frequently Asked Questions. If you do not see what you are looking for, feel free to call 609-399-3559 to get the answers you need. Visit our photo gallery to see pictures of some of the other parasailing enthusiasts. Notice the smiles on their faces and the excitement in their eyes! Visit our video gallery to see pictures of some of the other parasailing enthusiasts. Notice the smiles on their faces and the excitement in their eyes! From time to time, we offer coupons and discounts to encourage new parasailers to give Ocean City Parasail a try. Why not take advantage of one of our current promotions? We respect your privacy and never share, steal or hack your information. Please review our privacy statement to learn more about our spam-free commitment. By visiting the Ocean City Parasail website, you agree to the terms of service and conditions of responsible use. Read the terms of service to learn more.